It was November 18, 2012. This year my father and I started leasing 200 acres of land in Enfield, NY from a long time friend that I met in a fishing lodge in Altmar NY. He always told me about all the big bucks he kills, so I finally leased some land from him. I bow hunted several weekends with my dad there and passed up some decent bucks, but never saw a real shooter other than trail cam pics before the 18th. We were on stand and at 10:30 a.m. my friend called and asked if we wanted to get together with him and his other friends that own land in the area and hunt some new properties. I got my dad and we headed to meet them about a mile down the road. They were going to do some silent stalking with some standers around the property edge in case they busted any out. I was the third guy in line when the four stalkers started moving. across the road right in front of the buddy we lease from. He shot and missed. Another good friend from the lodge, that also leases land from my buddy was next in line. The buck was so glued to the doe he ran right in front of him as well... he shot and missed. I heard all this, and knew I was next in line so I got myself ready. stuck so bad his head was a foot or two off the ground. When I walked out of the woods I happened to walk right to my dad. He asked "Did you miss?" I said, " Nope, I got him." I said, "You wont believe me. Just wait until you see him." 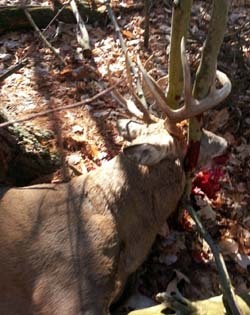 When I picked the buck up and brought him back for all to see, there was a bunch of wide open mouths. What a great day... I will remember it always. 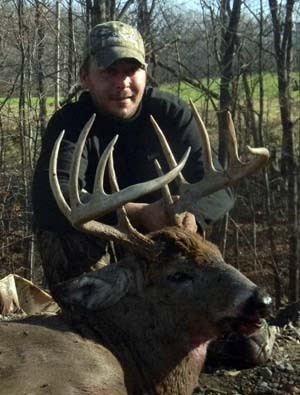 Dave's Tompkins County buck has a gross score of 161-2/8 and net score of 156-1/8.